The increase of environmental concerns and government regulations has spurred the chemical industry to innovation and reformulation of products that address a broad spectrum of human and environmental safety factors. Defining "green" chemicals is difficult because the concept encompasses a variety of factors: perception, empirical values, geographical area of use, the application for which they are used, available alternatives, and a knowledge of the total manufacturing process. 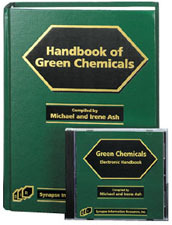 The Handbook of Green Chemicals describes approximately 7000 trade names that provide one or more of the following green attributes: biodegradable, environmentally safe/friendly, recyclable, HAPs-free, low ozone-depleting/nonozone-depleting, VOC-compliant/low-VOC/VOC-free, low global warming, low vapor pressure chemicals, non-CFC/non-HCFC, SNAP, nonhazardous, SARA-nonreportable, halogen-free, noncarcinogenic, and nontoxic. Manufacturers were canvassed for products meeting criteria listed above. These products were then screened for identifiable green attributes. This Handbook is designed to serve as a starting point and guideline in the decision-making process of chemical and material selection. Before making a final selection, all factors in the total process of product formulation must be considered, along with the government regulations that pertain to the specified application and site of use. The chemicals and materials included are used in every aspect of the chemical industry. The reference is organized so that the reader can access the information based on the trade name, chemical components, functions and application areas, green attributes, manufacturer, CAS number, and EINECS/ELINCS number. This section provides an alphabetical listing of trade names identifiable as green. Each entry includes the manufacturers name; chemical/material description; its detailed functions and applications in all aspects of industry; physical properties, such as form, molecular weight, density, solubility, boiling point, cloud point, flash point, pH, freezing point, activity; toxicology, storage, precautions, etc. Keyword Indexes: Comprehensive Index, Trade Name X-Ref, Generic Chemical X-Ref, Manufacturers X-Ref, CAS X-Ref, EINECS/ELINCS X-Ref, Functional/Applications X-Ref., Environmental/GREEN Attributes X-Ref., Toxicity and Precautions X-Ref. PART IIChemical Component Cross-Reference covers more than 2500 chemicals/materials that are contained in the trade name products section. Each entry contains information including the following: CAS (Chemical Abstract Service), EINECS/ELINCS (European Inventory of Existing Commercial Chemical Substances/European List of Notified Chemical Substances), and UN/DOT reference numbers, classification, definition, chemical synonyms, empirical and molecular formulas, properties, toxicology, precautions, storage, uses, use level, regulatory details, manufacturers and distributors (linked to the Manufacturers Directory). All chemical/material synonyms are cross-referenced back to the main entry. These entries are followed by a listing of the trade name products (linked to the Trade Name Products section) that are either equivalent to the monograph entry or contain it as one or more of its ingredients. Keyword Indexes: Comprehensive Index, Trade Name X-Ref, Generic Chemical X-Ref, Manufacturers X-Ref, CAS X-Ref, EINECS/ELINCS X-Ref, Functional/Applications X-Ref., Environmental/GREEN Attributes X-Ref., Toxicity and Precautions X-Ref., Molecular Formula Dir. This section, with more than 31,000 categories, is a powerful tool for locating materials based on their function and/or industrial application area. By searching for key functional words such as filler, reinforcement, diluent, bulking agents, extender, etc., combined with a specific application area, such as polystyrene, tires, cosmetics, coatings, etc., the user is directed to the trade names and/or chemicals and materials that have that specific functional/application attribute. The generic component names are distinguished from the trade names by italic type. Keyword Indexes: CAS-to-Chemicals Dir., Chemicals-to-CAS Dir., EINECS/ELINCS-to-Chemicals Dir., Chemicals-to-EINECS/ELINCS Dir.